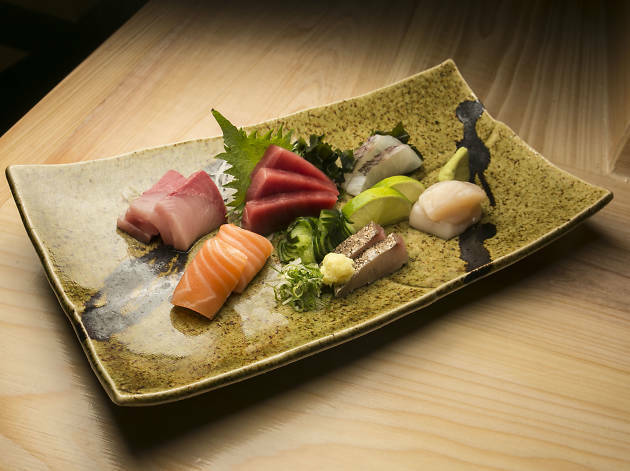 They’ve tackled ramen (Ganso Ramen) and izakaya fare (Ganso Yaki)—now Harris Salat and chef Tadashi Ono complete their Japanese trifecta with this 36-seat, white-brick spot focusing primarily on sushi and sashimi. 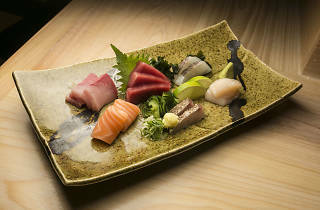 Combinations include an 11-piece sashimi plate (Scottish salmon, mackarel); a chef’s omakase of 10 pieces, one roll and a classic chirashi bowl with Osaka-style chopped sashimi over vinegared rice; as well as small plates like Kuro edamame with Japanese sea salt and steamed monkfish liver with yuzu ponzo sauce. Along with a wooden sushi counter, the cozy dining area is fitted with a mural-size Gyotaku (traditional Japanese fish print) by artist Momoyo Torimitsu.